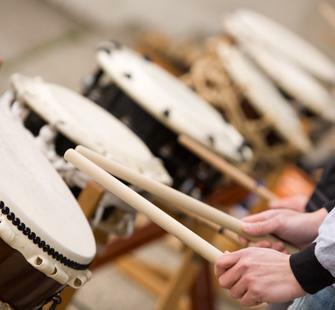 Students will learn the fundamentals of playing taiko, the artistic discipline of Japanese ensemble drumming! In addition to its cultural significance, they will examine its particular connection to Obon, the Japanese festival honoring ancestors’ spirits. The students will also learn a bon odori (Japanese folk dance) and decorate paper lanterns. At the end of the week, they will share their new knowledge and skills with friends and family in an abbreviated Obon performance.